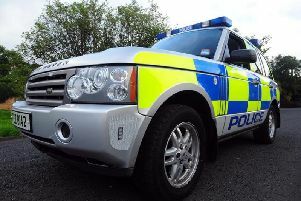 Two men are being treated in hospital after a one-vehicle road traffic collision in Magherafelt on Sunday afternoon. It’s understood the car crashed into an electricity pole in the King Street area and then went on fire. The two male occupants of the car, thought to be aged in their 20s, are believed to have been pulled from the car by passers-by. Both men sustained a number of injuries including burns. King Street was closed to traffic while firefighters, police and Ambulance Service personnel attended the scene. Motorists were advised to take alternative routes.